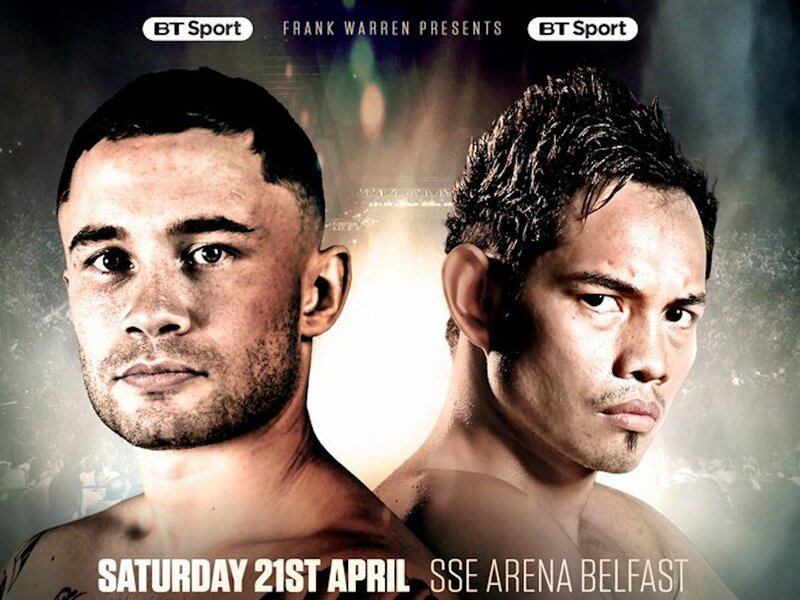 The WBO interim world featherweight title is on the line when Carl Frampton takes on Nonito Donaire at the SSE Arena in Belfast on April 21. Two-weight world champion Frampton (24-1-KO14) will enjoy home support when he clashes with four-weight world champion Donaire (38-4-KO24) – and the pair have been handed an extra incentive. The winner of the bout will become mandatory challenger to current WBO world featherweight champion Oscar Valdez, who made the fourth defence of his title with a points victory over Scott Quigg on March 10. Frampton said: “I’m completely focused on Donaire first and foremost but the fact it’s for the WBO interim title and the winner gets a shot at Valdez gives it something extra. “I’ve always been a fan of Donaire. It’s an exciting fight and I’m prepared for a hard night. I’ve got some quality American sparring in and I’m going to come into this one in the shape of my life. “I respect and admire Valdez, too. I like how he fights but I believe I’d have the beating of him. I was encouraged because Quigg had success against him. “Unless Quigg wins a world title, I’m not interested in him. I need to worry about Donaire and then when I’ve got the job done I’m chasing the likes of Valdez and the winner of Lee Selby v Josh Warrington. Both Frampton and Donaire have already won world titles in the 126lb division; Frampton winning the WBA ‘Super’ crown from Leo Santa Cruz in July 2016 and Donaire holding the same belt the previous year. ‘The Jackal’ Frampton, who unified super-bantamweight world titles by beating Quigg in February 2016, will be returning to the venue at which he outpointed Horacio Garcia back in November. The unbeaten Tyrone McKenna will face Anthony Upton Jr on the undercard of Carl Frampton v Nonito Donaire on April 21 following an injury to McKenna’s original opponent, Phil Sutcliffe Jr. Promising super-lightweight McKenna (15-0-1-KO6) will enjoy plenty of home support in Belfast on the night but must now redirect his attention to Upton Jr (17-1-KO6) after Dublin’s Sutcliffe Jr sustained a knee injury. McKenna said: “It’s always a disappointment because we’ve been preparing for Phil Sutcliffe Jr for the last seven weeks but we’ve managed to find a really good replacement. “It’s another Irishman stepping up to the plate; another Belfast man and that’s very exciting for the fans. I’ve known Anthony Upton Jr since he started boxing and I know it’ll be an exciting fight. Upton Jr said: “I’m very happy with this opportunity. I’ve waited for it for a while. Tyrone has been on big shows before and this is my chance to use that platform to show people who I am. While devastated to miss out on a huge chance to shine, Sutcliffe Jr is eagerly awaiting scan results and is determined to regain fitness and a date with McKenna at the first available opportunity. Sutcliffe Jr said: “Everything was going well and I was asked to do a few rounds with a local lad. In the fifth round, something went in my knee. We’re awaiting an MRI scan as we speak. “There were a few words said between Tyrone and I and I was looking forward to fighting him so much. It’s desperate at the minute. I’ll make the recovery process as quick as possible and get back to action.